VISION. The only word needed when speaking of the world’s most famous fashion photographer of our time. Peruvian-born Mario Testino’s knack for finding the lustrous and almost unattainable beauty in the beautiful, but more impressively the not-so-beautiful, has made him the most invaluable creative staple in the world of fashion. Shooting for the likes of Burberry, Dolce and Gabbana, Versace, and Chanel. Posing such posh people as Anna Wintour, the entire bloodline of the British Royal family, and a gaggle of glamorous super models and celebrities. Although Testino has uncovered, devoured, and savored immense success via international globetrotting, all the while keeping such esteemed and cultured company, the little boy from Lima has never taken his eye off his home. In between publishing a plethora of books and being awarded the Order of British Empire for his service in photography and charity, he’s managed to unearth and bring the beauty of his homeland to the surface for us all to set our eyes upon. 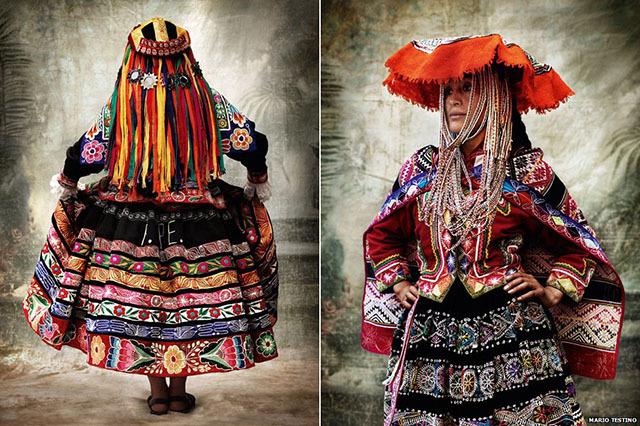 One of his newest bodies of work entitled Alta Moda (High Fashion) is a rich, almost VOGUE-like collection of traditional costumes worn by the Andes people in the Cusco Region of South Peru. The subjects are oozing with ultra decadent color so indescribable and unimaginably vivid, while capturing the textures of the fabrics and traditional adornments in such a tactile manner that one’s hand can’t help but slowly drift up in disbelief to touch for itself. Capturing a culture in just a few shutters of the camera is no easy feat. Making that culture reach out of the frame, grab you by your sweet face and force you to soak in every detail, takes a talent that’s almost haunting. Alta Moda can be viewed in the Barranco area of Lima, Peru at the Mario Testino Museum, a part of Testino’s MATE foundation that he founded in 2012.